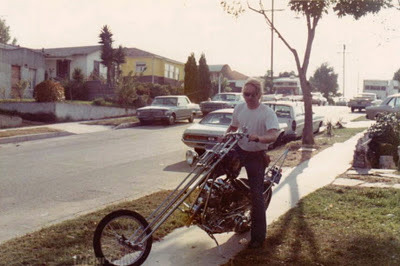 I believe this is Doc Holiday once again with another chopper around 1973 in Lawndale, CA. I'm not sure if it's a rebuild of the bike from the earlier post. If it is, it's now more akin to other long South Bay bikes. Would like to see more of it. Photo courtesy of Joe Hurst.